A few weeks ago, I was standing around inside Heathrow terminal 4 waiting for a flight to Los Angeles and spotted a group of young women all wearing Hunter wellies. A bit puzzled by this (as this is an airport we’re talking about, not a muddy field) I just had to go over and ask why they were all wearing footwear designed for horse riding and spashing about in the mud… their answers were a little shocking but not massively surprising – apparently wearing wellies, especially high end designer wellies, is a fashion trend, just like the recent trend for wearing long slippers (that’s UGG boots to you and me) outdoors and in wet weather – something which UGG boots were never designed for and are totally unsuitable for. Considering the fact that flying on an aeroplane is probably up there with being flogged and watching ‘I’m a Celebrity, Get Me Out of Here’ on the discomfort front, wearing wellies on a plane is surely the biggest mistake in history, but no… I’m reliably informed by our travelling fashion gurus that wellies are easy to take off (for airport security checks) and that during the actual flight these most unlikely of fashion items get stowed with the rest of the baggage in the overhead lockers. Quite what other passengers think of this I don’t know, but I’m told that if precautions are taken (I’m thinking industrial strength Odour Eating insoles here) then nobody else on the plane is adversely affected. As all fashion trends, the trend for wearing wellies came from somewhere and in this case it stemmed from the Royal connection. Hunter welly boots are one of those brands which are approved by HM the Queen and various Royals have over the years been spotted wearing this brand especially. 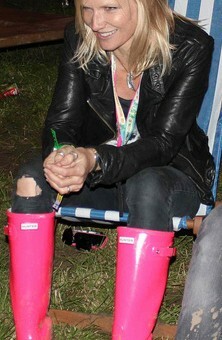 Of course, being involved in various equestrian events, it makes sense to wear rugged, waterproof footwear, but it seems various celebrities have also take to wearing these wellies, notably Supermodel Kate Moss and radio presenter Jo Wiley, who have been snapped many times sporting the Hunter brand. As fashion these days seems to be celebrity driven and you’ve also go that very potent Royal connection, the result is that wearing wellies in the most unlikely of situations is now somehow ‘trendy’. Are You a Welly Wearer? If you are one of those people who are going down the welly wearing trend, then good on you… at least you’re not boring! But please, please stay away from the pink wellies with any type of yellow polka dots, because, frankly, that’s just wrong! Trot2.com offer a large range of Hunter wellies in a selection of styles and colours.